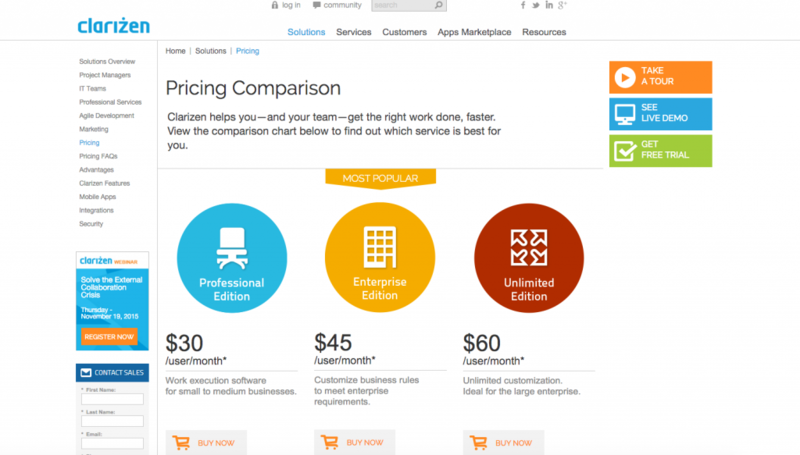 "Clarizen is an enterprise-class project management and work collaboration solution." 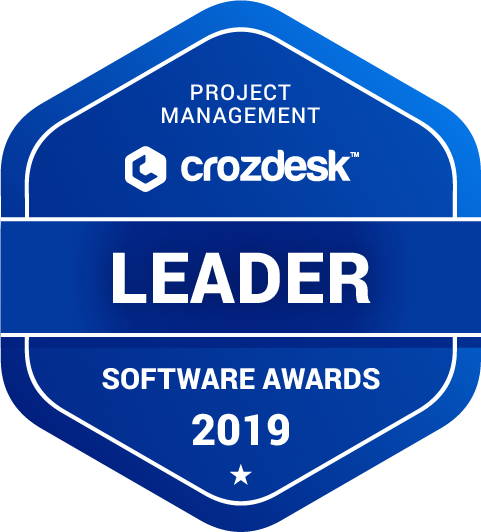 Clarizen scored 84/100 in the Project Management category. This is based on user satisfaction (77/100), expert reviews (85/100), press buzz (44/100), recent user trends (rising), and other relevant information on Clarizen gathered from around the web. Each week we feature an app that has caught the attention of the Crozdesk community. We look for exciting features that make our lives easier, apps that take a radical approach to existing problems or a service that has everyone talking about it. In other words, apps that we think you should know about. This week’s featured app is workflow and project management software Clarizen. Initial set-up of project management software Clarizen is a simple case of entering your name and email address and either choosing one of the paid plans or selecting the 30-day free trial. Once you’re signed up, Clarizen prompts you to invite colleagues to join, this is an optional step which can be skipped. The Clarizen home screen features the title of your project along with a dashboard which shows information such as Project Status, Project Management, Project Type, Number of Project Topics and Project Completion levels. Other features of the dashboard include a roadmap, which shows your project timeline, a workplan and a discussions pane. It is instantly clear that Clarizen has been well thought out in that it seems as though as much time has been spent in the layout and UX of the software as it has on the appearance. Clarizen is simple to use, but it also looks good, a balance which is not achieved by all project management software currently on the market. The Social function is a team discussion page, team members can start new discussions and choose whether to include their organisation as a whole or the specific department in which they work. New users or members can be invited to a discussion. The Projects window shows an overview of all created projects along with their completion level and whether or not they are on track. The tasks screen shows a list of all tasks that you have either created or are involved with. This view includes the option to add new tasks, mark tasks as complete, delete and share tasks. Each pre-created template comes with a range of preset tasks, in the case of the Tradeshow/Event Planning template, used here as an illustration, pre-created tasks include Badges, Passport/Visa, Hotel, Care Rental, Tickets and Social media Promotion. This is a highly useful feature because it means that Clarizen is actually adding value to users and their projects by offering sensible, thoughtful suggestions of the kind of tasks that might be required in that particular project. It can be the shortcoming of other project management software, that they do not offer any such suggestions, leaving all content to be user-generated. While such an approach is adequate, it is far more valuable for an app to offer suggestions which might help the user in achieving their end goal, in this case planning a Tradeshow or event. The Reports feature within Clarizen lists a wide range of different report options, offering data relating to your projects. Again, there is a useful range of pre-created reports within the Tradeshow/Event Planning project, these include All Cases to be Resolved in a Project; All Milestones Exceeding Budget Managed by Me; All Milestones Exceeding Budget per Project; All Opened Cases Committed to Customers; All Opened Cases per Customer and All Projects at Risk. Clicking on a report allows the user the opportunity to edit certain variables before generating the report in a new window. The People window allows new users to be added and removed while the User Groups feature allows User Groups to be created and edited. Discussions can also be added in the User Groups function, relevant for any discussions which are only relevant for a particular User Group. Skills such as MS Excel expert, for example, can be created in the Skills window and assigned to particular users, allowing Clarizen users to be associated with particular strengths. This could be useful when it comes to choosing team members to work on a particular project, especially in larger organisations. The Job Titles window offers similar functionality, allowing allocation of Job Titles to users. Clarizen enables users to associate projects with one or more customers so that customer-centric projects, such as service projects, build-to-order projects, build-to-customer and others are linked to their respective customer. The Customers module can be used by the Clarizen administrator to manage the list of the organization’s customers. The Templates module can be used to view and select time-saving templates. Clarizen is an impressive tool for Project Management. It is recognisable from first use that the software has been carefully developed for businesses of all sizes and as such has a huge range of options and functions, almost all of which are fully customisable. It is the breadth of Clarizen’s functionality and adaptability which sets it apart from other Project Management tools; any business looking for a cloud project management solution would do well to try Clarizen for these reasons. What are some applications Clarizen is commonly used in tandem with? Who are the main user groups of Clarizen? What platforms does Clarizen support? Does Clarizen integrate with any other apps? Does Clarizen offer multi-user capability (e.g. teams)? Does Clarizen offer guides, tutorials and or customer support? Does Clarizen offer an API? What is Clarizen generally used for? 3.83/5 based on 188 user ratings. What do you like about Clarizen? The one that is able to allow a large-scale personalization to its users is one of the characteristics that I like most about this software, since this allows a better adaptation when working with it, besides it is excellent for the collaborative work given that allows a very extensive and direct communication and some functions that allow the workflow, the management of the projects and the follow-up of them to be much more fluid. What do you dislike about Clarizen? Your support team could be more efficient since failures often occur and are difficult to solve and when they go to them they take time to resolve them, complicating the progress at the business level. What have you been using it for and what problems did Clarizen solve? Having this tool is really an advantage given that we can have everything in one place and be able to follow up on our projects in order to be aware of each progress, which facilitates communication with our clients, since in this way we provide them with the advance of them without the need for personal meetings. Great ideal tool for business project management. Clarizen have many features that make me like it, but the ones I like the most are the flexibility of its interface, because it can be customized in the best way possible so that each user adapts to it as quickly as possible, which can be done in a centralized collaboration. that is, where each user is aware of the discussions and silver strategies to carry out a much more efficient management of each project, I also love that he works in an automated way to carry out business processes, since this way he streamlines the same is why I consider that in general it is a very complete tool that adapts to each company. Although it is a very complete software, the one that includes everything in one makes it difficult to understand in certain functions, especially the financial side since this software is managed by control panels and it is there where it is difficult to explain for the whole team. I think that the user guide should be much clearer. It has allowed us to carry out project management in a much simpler and faster way since it gives us a real time visibility of how the progress of each project is going, exchange ideas, files and more, besides the weight of work It can be divided into tasks, subtasks which allows the whole team to participate in the development which is a great benefit because the productivity increases.